This level has medium difficulty. 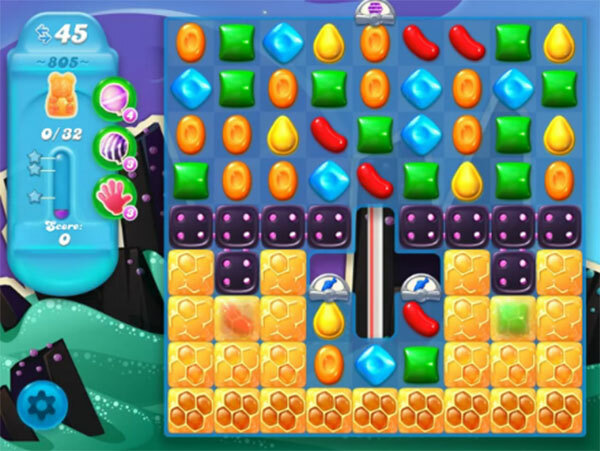 For this level try to play more near to blockers or from the bottom to shuffle the candies as it will help to have more special candy. Combine them with each other or play near to honey blockers to save the bears. Still STUCK on this level cannot save the bears at the bottom PLEASE HELP really DISGUSTED about ready to stop playing this game. 30 DAYS ON LEVEL 805 THIS IS NOT FUN. I PLAY EVERYDAY AND I AM SO BORED. EVERY LEVEL IS FUN BUT NOT FOR 30 OR MORE DAYS. MAYBE YOU SHOULD TRY GIVING SOME BOOSTERS LIKE THE OTHER GAMES THAT ARE ALSO FUN.